To his critics John Ruskin had a tendency to sermonise, and his personal relationships were perhaps unrealistic, but we should think better of the 19th century art critic and artist, according to Suzanne Fagence Cooper. Research curator of a new touring exhibition marking his 200th birthday, she says he was not only an exceptional art critic but a visionary – “someone who took the inter-connectedness of the world very seriously, who believed that we as modern people have to take responsibility for how we live in the world, how we live in the natural world, how we treat the people we work with and treat the resources of the world”. The exhibition, Ruskin, Turner & the Storm Cloud: Watercolours and Drawings, considers Ruskin’s relationship with his fellow artist, together with his own experience of fastidiously close looking at weather patterns, mountains and the built environment. It includes more than 40 works by Ruskin and a dozen from JMW Turner, including Constance, which Ruskin owned, hanging it in his bedroom at Brantwood, his house overlooking Lake Coniston. “This gorgeous blue and gold watercolour of Lake Constance in the Alps is a scene of calm and beauty,” says Fagence Cooper. “Then he can’t write any more and so draws a picture of factories belching smoke,” says Fagence Cooper. 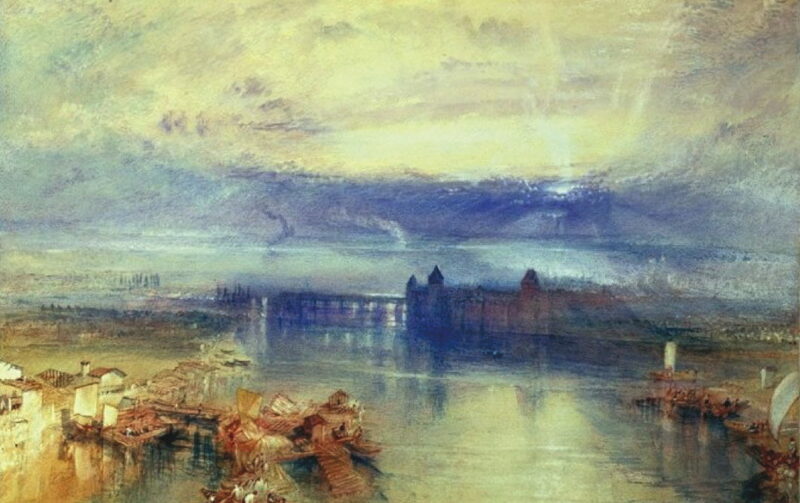 Ruskin championed Turner at a time when some of his contemporaries thought his paintings a mess. Fagence Cooper says Ruskin would carefully explain that his landscape works were instead “incredibly carefully created lived experiences” and that he was an “ideal modern painter” conveying a “moral truth as well as a visible one”. The exhibition will also consider Ruskin’s other relationships, says Fagence Cooper, author of a biography of Effie Gray, married at 19 to him and then later, after an unconsummated and annulled union, to Ruskin’s protégé John Everett Millais. Ruskin became infatuated with Rose La Touche when she was 10 and he taught her art. He waited until she was 18 and proposed to her. Gray told her parents he was “utterly incapable of making a woman happy”. She believes the relationship also highlights how difficult it was for people with mental health problems in the Victorian era to be treated. Ruskin’s doctor dismissed La Touche, probably suffering with anorexia, as a “perverse sprite, with their treacherous iridescent surfaces”. Ruskin died at Brantwood in 1900, having been nursed through bouts of mental illness by a cousin. Last summer, contemporary artist Emma Stibbon retraced one of his trips to Chamonix to draw and photograph the same Mont Blanc glaciers and her work is part of the exhibition. This time though, there was no ice. “Ruskin knew that things were going wrong,” says Fagence Cooper.